Working with The WestSiders on their 3-show tour for Spring 2016, I realized that an important but overlooked part of doing shows is the terminology used within the performing arts. So, here’s the beginning of what will eventually become a glossary on this site. Suggestions are welcome, so don’t be shy! In this episode, we’ll talk about time. Call – The time you’re supposed to be at the venue and check in with the Stage Manager or whoever is keeping track of who has arrived. House – When the house is open so the audience can enter and take their seats. Usually 30 minutes prior to curtain. Curtain – When the show starts. Also known as show time or go time (see below for other uses of go). Good manners aren’t just nice, they’re part of the theatrical tradition and used to improve communication. When someone delivers a notice requiring attention, such as letting everyone know the house opens in 5 minutes, they will say, “5 minutes to house, please.” The appropriate response from everyone within earshot is, “thank you.” This acknowledges that the message was received & understood by everyone. Some Stage Managers will repeat these announcements if they are not acknowledged by someone in the room. Warning – A term normally used among the tech crew to identify that a cue is coming up soon (1-2 minutes). Normal usage would be, “warning house lights to half,” or something similar. Standby – Comes after warning, it means that an action or cue is imminent (30-60 seconds). Once you have arrived for your call time, be sure that someone knows where you are if you leave the general area of the action. This becomes more important as curtain time approaches, since everyone needs to be in the right place at the right time so the show can begin on schedule. Few things cause more havoc at shows than for crew members to have to track down missing performers. And sometimes in the case of concerts, for others to track down missing crew members. Even a one-person show takes more than one person to make it happen. 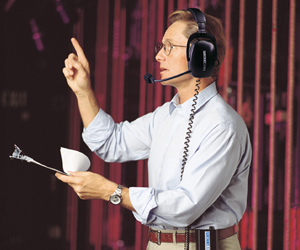 Everyone involved in the production of a show is part of a team, and a very interconnected team at that. The best rule to follow is the simplest: Be Mindful. Which Number is Larger 4 or 7 ?